he United States didn't want to get involved in World War II, and it took the attack on Pearl Harbor to cement public opinion about our military involvement in that war. After the attack Present Franklin D. Roosevelt proclaimed, "December 7th 1941- a date which will live in infamy." The United States declared war on Japan and in turn, Nazi Germany and Italy declared war on the United States. Fighting a war in a remote outpost in the South Pacific and Europe, the US military knew that they needed a special group of trades-people that could build the infrastructure required. So special Navy construction battalions were created after the Pearl Harbor attack, which became operational in June 1942. 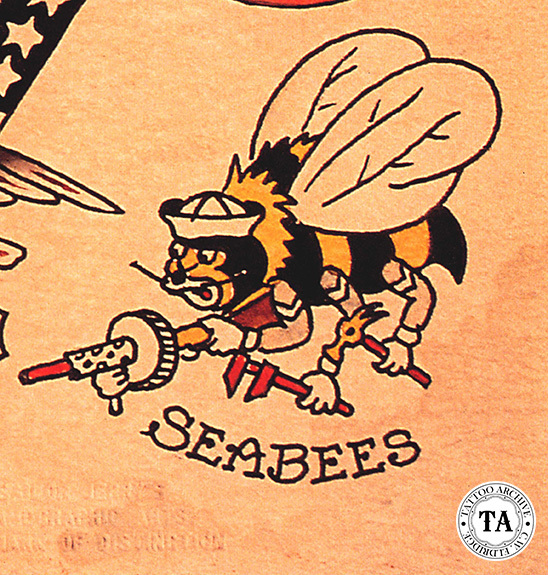 Their name, Seabees is a phonetic acronym from the initials CB Construction Battalion. The C was spelled "sea" because they were Navy men. The early Seabees were recruited from the civilian construction trades and trained in Davisville, Rhode Island. 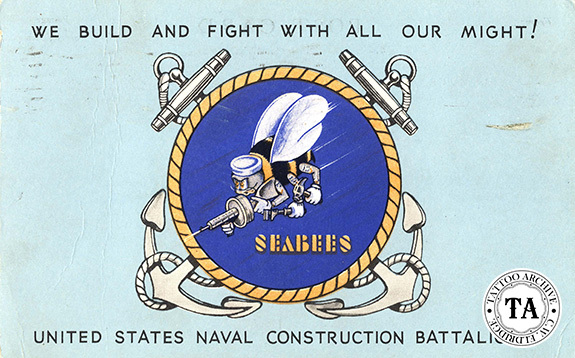 The average age of a Seabee was 37 years old because skill and experience was needed. The Seabees would land right after the Marines and would build airstrips, bridges, roads, and gasoline storage tanks. Quonset huts would be used as warehouses, hospitals and housing. 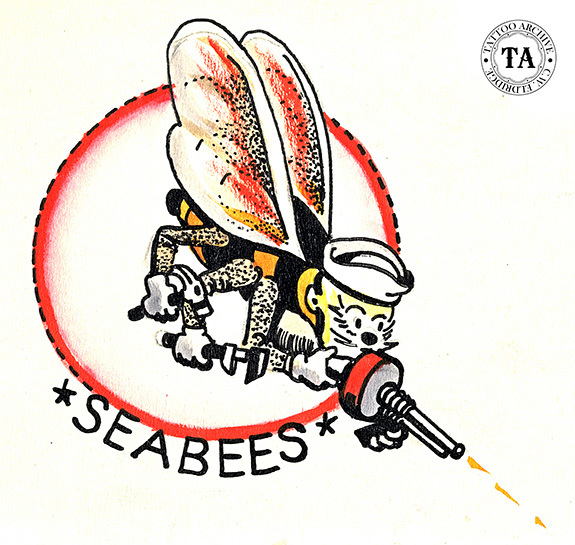 The logo for the Seabees was a fighting bee and became a popular tattoo design probably as soon as it went into use in 1942. Frank J. Lafrate, a civilian file clerk at the Naval Air Station in Quonset Point Rhode Island, designed the logo and it has remained unchanged since then. 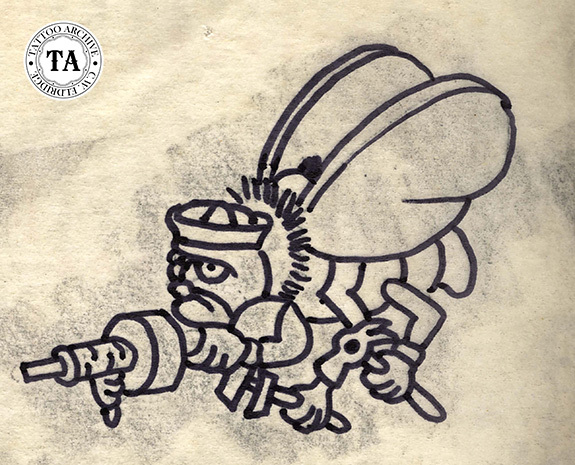 Later in 1942 Lafrate enlisted in the Seabees and served as a Chief Carpenter's Mate. An interesting side light to the creation of military insignia during World War II, is that artists working for Walt Disney created over a thousand military insignia. These designs were used as unit logos and nose art on bombers. While doing research on this article, I came across a great web site about Disney's involvement in the war effort: http://toonsatwar.blogspot.com.